Left: SCP-2736-1 in Foundation custody, 1973. Right: SCP-2736-2 during second presidential term, 1973. Special Containment Procedures: For its own protection SCP-2736-1 is kept at Armed Site-29, in a standard humanoid containment chamber.1 Subject is allowed a television and a subscription to a newspaper of its choosing; a monthly allowance of $20 $30 $50 $75 $100 $125 US (amount periodically increased to account for inflation) has also been set aside to procure SCP-2736-1 with reading material and other media it may request. Once a week subject is allowed one hour in the small courtyard at the center of Building 11, under the supervision of one guard. Once a year subject is allowed one new photograph each of Patricia Nixon, Tricia Nixon Cox and Julie Nixon Eisenhower. All privileges are contingent on good behavior, and may be rescinded at any time by Project Head/2736. Subject’s health should be monitored closely, as it has a history of phlebitis. SCP-2736-2 is uncontained at present. Long-term surveillance is to be maintained, with successful infiltration of its inner circle remaining a Class-IV Priority. UPDATE: Special Containment Procedures for SCP-2736 were discontinued on 23/04/1994. Description: SCP-2736 consists of two biologically-identical adult males, SCP-2736-1 and SCP-2736-2; as far as can be ascertained, both are former U.S. President Richard M. Nixon. They are the result of a little-understood event designated “Incident Janus-2736”, which resulted in a hitherto non-anomalous Richard M. Nixon being “split” into two distinct individuals through unknown, anomalous means. 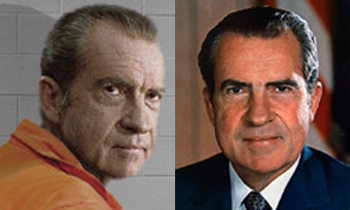 SCP-2736-1 and SCP-2736-2 appear to share the entirety of Richard M. Nixon’s memories up to Incident Janus-2736, at which point each individual developed a distinct consciousness; however, this cannot be conclusively verified due to the unavailability of SCP-2736-2 for study. SCP-2736-1 has been in Foundation custody since Incident Janus-2736, allowing its existence to remain concealed from the public. Despite having been produced through anomalous means, SCP-2736-1 displays no anomalous properties save for sharing a Level-II causal relationship (physical, mental) with SCP-2736-2 (see Addenda 3, 5). Heavy scarring is present on subject’s chest, the result of injuries sustained during Incident Janus-2736. 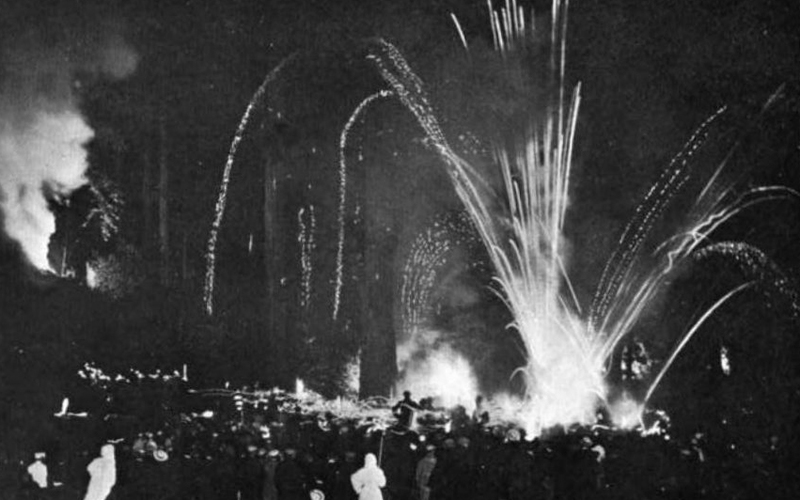 Recovery: On 21/06/1951, Undercover Task Force Theta-3-3 (“Federal Reserves”) conducted a covert surveillance mission at the private campground known as Bohemian Grove, in Monte Rio, CA.3 Theta-3-3 agents embedded in the campground’s security force observed a summer solstice celebration attended by members of GoI-113, which culminated in Incident Janus-2736. Note: The original film log was compiled from footage covertly shot by Theta-3-3 agents using two concealed, hand-held cameras. Camera-1 was situated at the back of the crowd, with a view of the entire clearing; Camera-2 was situated near the front of the crowd, with a relatively close view of the proceedings. Footage is in black and white. <00:01> Camera-1 shows a large clearing surrounded by giant redwoods. It is nighttime. At the center of the clearing stands a dilapidated 10m-tall stone statue depicting a ram’s head. At the foot of the statue a large bonfire is burning; aside from some wooden torches carried by attendees, this is the only source of light. Several meters from the fire, a deep rectangular hole has been dug into the ground, and the removed earth piled next to it. The camera pans over a crowd, showing roughly 500 people in attendance. All are wearing dark robes with the hoods drawn. <07:28> (Camera-1) The crowd parts as a group of fourteen men arrive in the clearing and make their way toward the fire. All of them are dressed in robes. <07:52> (Camera-2) R.N. is escorted to the front of the crowd and made to stop at the foot of the statue. A high-backed wooden chair, similar in appearance to a throne, is brought beside him. Some of the men around R.N. remove his robe, leaving him naked. <11:13> (Camera-2) Twelve of the masked men position themselves around R.N. Each one produces a knife from inside his robe. The thirteenth man, who will henceforth be referred to as “Speaker”, turns toward the crowd. Speaker: Tonight marks the dawn of the New Age. Speaker: Tonight we witness the Birth of the First. <12:05> (Camera-2) One of the masked men, who will henceforth be referred to as “Masked Man-1”, approaches R.N. <12:52> (Camera-2) Masked Man-1 raises his knife to R.N.’s face. <13:20> (Camera-2) Masked Man-1 faces the crowd and raises his arm high above his head. He is holding a small object in his hand, from which blood appears to be dripping. Speaker: We offer his left eye to the Fire, that the King may always see. <13:33> (Camera-2) Masked Man-1 throws the small object into the bonfire. <13:49> (Camera-2) Another masked man, who will henceforth be referred to as “Masked Man-2”, approaches R.N. with his knife raised and takes hold of his jaw with his free hand. Speaker: We throw his tongue into the Flames, that the King may never betray himself. <14:42> (Camera-2) Masked Man-2 throws a small object into the bonfire. <15:10> (Camera-2) The remaining masked men, to be henceforth referred to as “Masked Men-3 to -12”, line up at R.N.’s side and take turns cutting at his hands with their knives. Speaker: We cast his fingers into the Furnace, that the King’s grip may never weaken. <16:31> (Camera-2) Masked Men-3 to -12 each throw a small object into the bonfire. <17:19> (Camera-2) R.N. is now bleeding profusely from the injuries sustained to his face and hands. Several of the masked men remove him from the chair and carry him over to the nearby hole, into which he is lowered. <18:44> (Camera-2) Several of the masked men take shovels and begin burying R.N. alive. Speaker: We give his body to the Pit, that the Eternal Depths may grind it to dust, rending chaff from wheat. <21:25> (Camera-2) The masked men finish burying R.N. alive. <21:42> (Camera-1) Two identical straw effigies, each measuring roughly 3m in height, are brought from the edge of the clearing to the foot of the statue, and propped up over the bonfire. <22:14> (Camera-2) The effigies begin to burn. Still frame from Camera-1, at <25:16>. Speaker: The First will be reborn. <37:49> (Camera-2) View of the filled-in hole where R.N. is buried. The earth over the hole begins to shift, as though something were moving under the surface. <38:09> (Camera-2) Speaker approaches SCP-2736-2 and helps it to stand up. <38:43> (Camera-2) Speaker appears to address SCP-2736-2 before handing it a knife. <38:51> (Camera-2) SCP-2736-2 takes hold of the knife and turns toward SCP-2736-1. SCP-2736-1 attempts to stand up, but before it is able to SCP-2736-2 jumps on top of it and attempts to stab it with the knife. The two men struggle, with SCP-2736-1 sustaining a number of deep lacerations to its chest. <39:30> (Camera-2) SCP-2736-1 takes hold of a rock on the ground beside it and strikes SCP-2736-2 on the side of the head with it. SCP-2736-2 falls back, stunned. SCP-2736-1, bleeding from its injuries, stands up and flees from the crowd. <39:41> (Camera-1) View of SCP-2736-1 running toward the trees. Several of the masked men, as well as men from the crowd, start running after it. At this point, taking advantage of the general confusion, Theta-3-3 Commander William Meeks instructed Theta-3-3 agents to attempt to recover SCP-2736-1 and extract it from Bohemian Grove. It was thought that SCP-2736-1 might prove amenable to the Foundation given GoI-113’s treatment of it, as well as provide valuable information regarding GoI-113 and LoI-729. The extraction was successful, though three Theta-3-3 agents were killed in the ensuing firefight with Bohemian Grove’s security force. Following its extraction from Bohemian Grove, SCP-2736-1 was taken to Site-109, where its injuries were treated. W.M. : I’d like to ask you some questions, if you’re feeling up to it. SCP-2736-1: All right. I suppose I owe you boys that much. W.M. : Thank you. For the record, could you please state your name, age and occupation. SCP-2736-1: Richard Nixon, 38. I’m a U.S. Senator. W.M. : How did you first become involved with Bohemian Grove? SCP-2736-1: About uh, a year ago I was introduced to some people at a dinner. Real big-wigs. We got to talking, and they said I should come to the Grove for a weekend. SCP-2736-1: Some people would kill for an invitation like that. W.M. : What happened when you were there? SCP-2736-1: Nothing much, that first time. They mostly showed me around. Beautiful place, all that forest, those redwoods… Old, real old. We spent most of the time at one of the lodges, drinking, smoking. We talked. SCP-2736-1: Well, uh… me, actually. They seemed real interested in me, kept asking what I wanted out of life, what my plans for the future were. At one point I mentioned my career wasn’t going as great as I thought it could. They told me maybe they could help. W.M. : Help, in what way? SCP-2736-1: They didn’t exactly say then, they just told me I should start coming to the Grove regularly, meet some more people. Wasn’t long I was spending at least one weekend a month there, sometimes more. The people they had there, I tell you… Seemed like everyone who mattered was a member. Congressmen, governors, you name it. People with real power, too, bankers, defense contractor presidents, oil magnates. And these men I’d never even heard of, but you could tell how important they were just by the way the millionaires and billionaires looked at them. Like they were scared of them. After just a few months there I’d made more political contacts than I had in my entire career up to that point. All of a sudden I had all these prospects. W.M. : So how did you wind up here? SCP-2736-1: (sighs) This one night I was invited to a ceremony. They said it was a club tradition, so I didn’t question it when they gave me a robe to wear. We had to walk to this place in the forest called the Ram Shrine. Hundreds of us, all walking in the dark with torches. Took us almost an hour. Then we reached this open area with a statue of a ram’s head, and the ceremony started. Real macabre stuff. At first I wasn’t sure if I was meant to take it seriously, but then I… saw… things. That’s when I realized who I was dealing with, what those people were capable of achieving. When we got back to the lodge that night they made me a member. Wasn’t long after that they offered to make me King. SCP-2736-1: They said we were entering a new era for mankind, but before that could happen four great Kings would have to rise to prepare the way. They said they’d been looking for someone like me for a long time, someone to be the first King. They told me the whole world could be mine, all I had to do was say yes. SCP-2736-1: (pauses) Yes. And then last night they brought me back to the Ram Shrine and… well, you were there, you saw it. They’d warned me it wasn’t going to be pleasant, I just… I didn’t realize it would be that bad. But they said all they’d be doing to me would be for a reason. That before I could be the First I had to be reborn. W.M. : When they put you in the earth you remained buried for over fifteen minutes. Do you remember anything that happened during that time? SCP-2736-1: Listen, I’m really tired, and I need to call my wife, tell her where I am. Do think you could arrange that? W.M. : I’m afraid that won’t be possible. SCP-2736-1: I told you, I’m not saying anything else to you until you let me talk to my wife! W.M. : I lost three men getting you out of that place, not to mention an entire surveillance network that’s taken us decades to establish. You need to start cooperating with us. SCP-2736-1: It’s not like I’m not grateful for what you did, but you’ve got me locked up here like some goddamn convict! You can’t do this to me, I’m a U.S. Senator! Now you call your supervisor, or whoever it is that’s in charge here, and you tell him I’m going home, today! Pat and the girls must be worried sick, poor things. W.M. : That’s what I came here to discuss with you. The other “you”, the one we couldn’t recover last night, we’ve… located him. SCP-2736-1: Well, that’s good news. Where is he? W.M. : At… at your house. SCP-2736-1: At my… (becomes agitated) What’s he doing there? What does he want? God, are Pat and the girls okay, did he… did he hurt them? W.M. : It’s not what you think, your family’s safe. W.M. : Yes, it’s… more complicated than that. See, the other “you”, he’s not just at your house. He’s been living there, since yesterday. As far as your wife and daughters are concerned… you’re not even missing. SCP-2736-1: (prolonged silence) That… thing… is with them, now? SCP-2736-1: And they don’t… They think he’s me? W.M. : That’s right. I’m sorry. W.M. : We’d like to, but your friends from the Grove, they seem to want him there. They’ve got security on him like you wouldn’t believe. We can’t even get close. SCP-2736-1: But that’s… they can’t just do that, put some… impostor in my place like that! You’ve gotta warn Pat about this, you’ve gotta let me call her! W.M. : Like I said before, we can’t let you speak to her. That’s not up for discussion. As for warning her, there isn’t much of a point. I mean, even if we managed to get through to her, I doubt she’d believe a word we said. W.M. : I understand this is upsetting for you, but there really isn’t much we can do, at least for the time being. That said, any information you can give us about Bohemian Grove, your interactions there, what you think happened to you the other night, it could all help us find a way to solve this. SCP-2736-1: (shouting) That’s your solution? I just learned some creature is sleeping in the same bed as my wife, and you try to pump me for more information? You’ve got some goddamn nerve! W.M. : Hey, we’re not even sure she is your wife, so yeah, I think we’re entitled to some answers. SCP-2736-1: What are you talking about? W.M. : You keep telling us you’re the “real” Richard Nixon, like it should be obvious to us. But nothing I’ve seen, nothing you’ve said to me, has pointed to you being any more “real” than the other “you”. For all we know the man in your house is the real you, and you’re the fake. Or maybe you’re both Richard Nixon, both real. SCP-2736-1: That thing isn’t me, I told you! I’ve… I’ve been thinking about it a lot, since I got here. About what happened at the Grove. I think I understand it now. SCP-2736-1: What they did to me, turning me into two people, it’s not… They didn’t make two identical people, that wasn’t the point. I’m not the same as him, I know it, I feel it. Hell, I’m not even the same man I was a few days ago. What they did to me, it changed me. SCP-2736-1: Used to be I was so restless, I had so much ambition. I… craved advancement, position… power. SCP-2736-1: It’s like that part of me’s just gone. Well… not gone. I know where it went. SCP-2736-1: (sighs) You know that night they offered me to be the First? Do you know what they asked me, just before? Do you know what I said to them that made them decide I was the right guy for the job? SCP-2736-1: They asked me what I was prepared to do for power. I told them, ‘anything’. I said that. Sounds crazy now, but I said it. And I meant it, every fiber in me did. Like I said, it’s not who I am anymore. But it’s who he is. Hell, it’s all he is. That’s what they wanted. They got their King. And now you tell me those bastards have got him living with my family. 21/06/1951: Incident Janus-2736 at Bohemian Grove. 04/11/1952: Dwight D. Eisenhower is elected to the office of the President of the United States, with SCP-2736-2 as his Vice-President. 06/11/1956: Dwight D. Eisenhower is re-elected to the office of the President of the United States, with SCP-2736-2 as his Vice-President once again. 05/11/1968: SCP-2736-2 is elected to the office of the President of the United States. 20/07/1969: NASA’s Apollo 11 spaceflight lands the first two humans on the moon. 07/11/1972: SCP-2736-2 is re-elected to the office of the President of the United States. 09/08/1974: SCP-2736-2 resigns from the office of the President of the United States in the wake of the Watergate scandal. 08/09/1974: U.S. President Gerald Ford grants SCP-2736-2 a full pardon for any crimes committed during its presidency. The following interview with SCP-2736-1 was conducted on 15/09/1974 (23 years since initial containment), in order to discuss SCP-2736-2’s recent resignation as U.S. President. S.B. : I take it you’ve been watching the news. SCP-2736-1: I tell you, uh, you never get used to seeing your face on television. S.B. : (chuckles) I can imagine. How have things been for you, though? Can’t have been easy watching all of this unfold. SCP-2736-1: It wasn’t, watching him do that to my name, to this country, to… to Pat and the girls. They're even saying his marriage is on the rocks, did you hear that? Not that I’m complaining, mind you, but I just keep thinking of Pat, about what she must be going through. At least he resigned, though, there's that. It’s over now. S.B. : Yes, his political career certainly seems to be over… Actually, I was hoping to get your thoughts on something. S.B. : Now, before the ritual at Bohemian Grove that began all this, you said your friends had told you the world would be yours if you became King. S.B. : Then how do you account for the events of the last few months? SCP-2736-2 becoming embroiled in a nationwide scandal, losing all his political capital, being forced to resign in disgrace? And it’s not just the last months, is it? From the start it’s never really gone his way. First time he ran for president in 1960 he lost to Kennedy. Then Kennedy winds up dead not long after, and a few years later SCP-2736-2 does become president, but even then… the Vietnam War, the bombing of Cambodia, all terribly unpopular things that ultimately result in failure. And finally the Watergate scandal. We’re far from the success your friends at the Grove promised you, wouldn’t you agree? S.B. : I’d like to know why you think that is. Is it possible the promises were all a lie? SCP-2736-1: I really doubt that. I mean, it was in their best interest to put me in power and uh, keep me there. S.B. : Then do you think they simply weren’t capable of delivering on their promises? That maybe they were never as powerful as you were led to believe? SCP-2736-1: No, not a chance. I know for a fact they were capable of everything they promised me. More, probably. S.B. : Then… why? Why all the setbacks? Why this latest failure? SCP-2736-1: Well, my “friends” from the Grove, as you call them, they haven’t been idle all these years, have they? S.B. : What do you mean? SCP-2736-1: I mean, they’ve been looking for me since that night at the Grove. I’m right, aren’t I? S.B. : I’m… I’m not cleared to discuss this with you. SCP-2736-1: I understand that. But I’m not blind, I know there’s a reason you transferred me to this place.4 Why else would I need all this security? I’m not dangerous, this isn’t for me. I think my “friends” were looking for me back then, and they still are today. I think all this time they never stopped. S.B. : Well, let’s… let’s say for a moment that were true. Why do you think that would be? Why would they keep dedicating so much time and effort to finding you? SCP-2736-1: Because the ritual was never finished. When you guys rescued me at the Grove, you threw a big wrench in their plans. Didn’t even realize it, but you did. That’s why it’s all gone to hell for them, for him. I was supposed to die that night. On 12/10/1974, SCP-2736-1 fell ill with phlebitis, and had to undergo surgery with a Foundation phlebologist. The same day, SCP-2736-2 was hospitalized for phlebitis in Long Beach, CA, for which it received surgery and treatment. On 22/06/1993 (42 years since initial containment), Patricia Nixon died of lung cancer at her home in Park Ridge, NJ.5 SCP-2736-1 was greatly affected by her death, and in the following months grew increasingly withdrawn, refusing to participate in interviews with Project Head/2736. Subject also frequently complained of poor sleep. On 18/04/1994 (43 years since initial containment), at roughly 17:45 EST, SCP-2736-1 suffered a massive cerebral vascular accident (CVA) and was transferred to Armed-Site-29’s Yellow Infirmary. It was later learned that SCP-2736-2 had also suffered a CVA at the same moment at its home in Park Ridge, NJ, and had been taken to New York–Presbyterian Hospital in New York City, NY. Both subjects were left partially paralyzed and incapable of speech, and developed cerebral edema over the following days. Despite its condition, on the evening of 21/04/1994 SCP-2736-1 inexplicably began to speak, albeit in an agitated and delirious manner; infirmary staff alerted Project Head/2736, who was able to record nearly 20 minutes of audio content. <00:46> The ground bled red oil for seven days, and we wondered at the bodies buried there. Billions. Souls are always the first casualty. Nothing changes, but change is coming. <03:03> The moon was only one small step. <10:55> Prayers are pretty things, but you can’t escape it. The sky will rend. <12:11> The first falls on his sword, but his blood sows the seeds for the next thousand years. The second wipes up all the sins, and no one finds the gnawed bones under the castle. The third smiles at the world with double-edged teeth, and his laugh opens the floodgates. The fourth defies the masters and forever pays the price. <13:45> Chimneys higher than mountains. Smoke to blot out the clouds. We will unite under one banner. New orders of magnitude. World without end. Without eyelids. <16:14> America fell in the beginning. It will fall again, deeper down the well to the other places that don’t let you blink. You were warned of this. <18:18> (voice trembling with fear) He… sees me. Immediately following this, SCP-2736-1 fell into a deep coma; SCP-2736-2 was later reported to have fallen into a coma at the same moment. The following day, 22/04/1994, SCP-2736-1 and SCP-2736-2 simultaneously died at 21:08 EST. On 23/04/1994, SCP-2736 was reclassified as “Neutralized”. 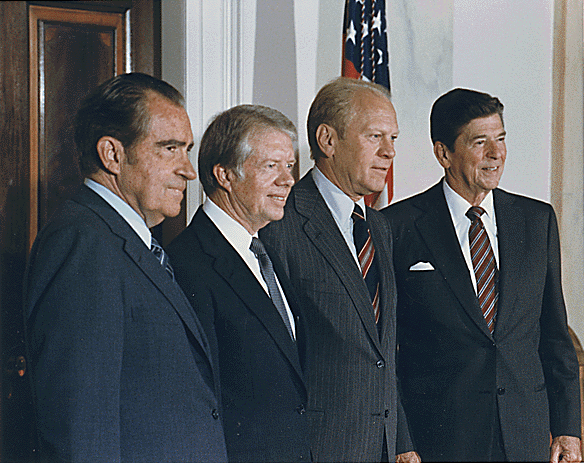 From left to right: SCP-2736-2, 39th U.S. President Jimmy Carter (PoI-62679), 38th U.S. President Gerald Ford (PoI-56121), and 40th U.S. President Ronald Reagan (PoI-86761), 12/10/1981. 1. Armed Site-29: a high-security containment facility located outside Tallahassee, FL. 2. GoI-113: a highly-secretive group comprised of members of the global elite, who refer to themselves as "Magog's Multitude"; known to maintain their power and influence over the world through occult means, including the ritualistic worship of non-human entities. 3. Bohemian Grove (a.k.a. LoI-729): a secluded, heavily-wooded site owned and operated by GoI-113 since the late 1870s; it continues to be the setting for occult rituals and ceremonies by members of GoI-113. 4. SCP-2736-1 is referring to its transfer from Site-109 to Armed Site-29 in 1954, following an attempt by GoI-113-hired mercenaries to break into the wing of Site-109 where it was being kept. SCP-2736-1 was never told of the break-in attempt. 5. Patricia Nixon: wife of Richard M. Nixon and former First Lady of the United States.